Set in a world where crime and government coexist, American Made is the jaw-dropping true story of CIA pilot Barry Seal that the Hollywood movie starring Tom Cruise is afraid to tell. Barry Seal flew cocaine and weapons worth billions of dollars into and out of America in the 1980s. After he became a government informant, Pablo Escobar’s Medellin Cartel offered a million for him alive and half a million dead. But his real trouble began after he threatened to expose the dirty dealings of George HW Bush. 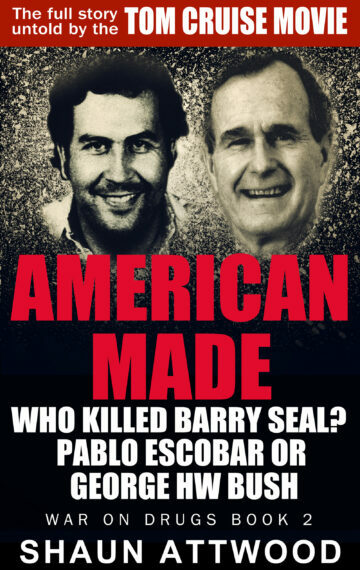 American Made rips the roof off Bush and Clinton’s complicity in cocaine trafficking in Mena, Arkansas. Shaun Attwood’s WAR ON DRUGS SERIES – PABLO ESCOBAR, AMERICAN MADE, WE ARE BEING LIED TO and THE CALI CARTEL – are harrowing, action-packed and interlinked true stories that demonstrate the devastating consequences of drug prohibition.